First written references to Częstochowa date back to the 13th century. The small settlement, situated on the Warta river, where major trade routes crossed, later grew into a town with numerous economic privileges, which promoted the development of trade and crafts. Thanks to the foundation of the Paulite Fathers' Monastery at Jasna Góra with the much revered Picture of Black Madonna the fame of this place was spreading rapidly since the 15th century and great numbers of pilgrims from different regions of contemporary Poland and also from Bohemia, Moravia and Hungary started to flock to Częstochowa. Yet various disasters - numerous wars, fires, plunder - thwarted the development of the town for almost two centuries. It was not before the 19th and 20th centuries that the economic conditions in Częstochowa improved again which brought about the unparalleled so far development of industry and business relations. Today Częstochowa is the City of transforming economy, with the dynamically developing service, small manufacture and crafts sectors and also a thriving academic centre with numerous institutions of higher education. The Chapel with the painting is much smaller than the adjacent Basilica Minor but it is, of course, the sanctuary's core. It started as a tiny wooden shrine in 14th c. and was then rebuilt and expanded several times across the ages till it gained its present Baroque look. It's always been famous for the many miracles received through the intercession of the Virgin Mary. The chapel's walls are literally lined with votive offerings (crutches, glasses, jewellery, etc) and there are even more in the sanctuary's Treasury. And the icon is set in an altar of ebony and silver that was itself a votive offering from one of our Grand Chancellors in 1650. The chapel is also the resting place for the cinerary urn of father Kordecki who lead the sanctuary's defence against the Swedish siege in 1655. Czestochowa - Silesian province, 260 000 inhabitants. Czestochowa lies at the heart of southern Poland, among the picturesque Jurassic rocks of Krakow-Czestochowa Upland, national parks and ruins of medieval castles. But for the majority of Poles Czestochowa it is above all Jasna Gora - the biggest Marian sanctuary in the country and one of the greatest on earth. Everyday, crowds of pilgrims journey here to see the phenomenal picture of Virgin Mary. In western part of the city, protruding up to almost 300 metres there is a hill with an array of sacral and residential buildings, surrounded by fortified banks and a park. This hill is called Jasna Gora, which means a Bright Mountain. It is hard to believe that it is visited by 5 millions people each year. Their goal is the Chapel of Holy Lady of Bright Mountain (Kaplica Matki Bozej Jasnogorskiej) with its icon of Virgin Mary called a Black Madonna. The legend has it that this picture depicts the true face of Our Lady painted by St. Luke the Evangelist on a board from the Holy Family's kitchen table. According to experts the picture is probably a Byzantine icon from the end of 7th century, painted over in the 14th century by an anonymous Italian painter. However it is still a mystery how the picture got to Czestochowa. One of the oldest documents from Jasna Gora states that the picture travelled from Jerusalem, via Constantinople, to finally reach Czestochowa in 1384. The picture's fame grew and more pilgrims came leaving precious gifts in the sanctuary. However, it lured thieves too and during the Easter of 1430 a band of Hussites invaded the chapel and slashed the face of Virgin Mary with a sabre. The picture was repainted but the scars on the face of Our Lady were left as a memento. It spurred another pilgrimage boom and more attempts of robberies, and the monastery had to be extended and it was eventually was turned into a fortress surrounded by massive walls, bastions and a moat. The fortress soon played an important role while withstanding large Swedish sieges in 1655 These battles are commemorated by three cannons named after the brave defenders: Augustyn Kordecki, Stefan Zamojski and Piotr Czarnecki. These heroic victories were regarded as the miracle of Black Madonna and Czestochowa's fame grew even more. It also made the grateful Polish King Jan Kazimierz to crown Black Madonn Queen and Patroness of Poland. Besides the chapel worth seeing is also the Basilica (Bazylika). Its beautiful Baroque interior is rich in paintings and stucco works. The Treasury (Skarbiec), built in the 17th century offers valuable exhibits presented by the faithful - from kings, princes, popes, bishops and common country folk. Among these gifts there are many fine pieces art: reliquaries, robes, jewellery, medals and drawings by famous Polish painter Matejko. The oldest gifts come from the 15th century. We recommend visiting also the Arsenal, Knights' Hall (Sala Rycerska) and the 600th Anniversary Museum (Muzeum Szescsetlecia) full of interesting objects, art and gifts, including Lech Walesa's Nobel Peace Prize. To widen your horizons climb up the 519 steps of the tower (wieza). From the heights of over 100 metres enjoy a magnificent view of the monastery, city and the picturesque Czestochowa landscape. Check numerous shops, stalls and booths outside of the monastery walls for more literature on the interesting history of the monastery. There are shops offering paintings of saints, holy water in Maria-shaped bottles to phosphorescing drawings of Jesus, soutanes and surplices. A few decades ago, to tarnish the religious importance of Czestochowa, communists converted the city into an industrial centre, which is still easily noticeable although the city has changed since. The most representative street is Aleja Najswietszej Marii Panny. Here are some famous cafes tempting with doughnuts with rose fillings and apple or cinnamon pies. - Romantic and dreamy ruins of the castle in Olsztyn are only 6 km from Czestochowa. Do not miss. - Trail of the Eagles' Nest - a famous tourist route from Czestochowa, going via Olsztyn up to Cracow (Krakow) consisting of fascinating chalkstone hills and peppered with many impressive castles. Southern Poland has its Eagles' Nest Trail - the ruins of dozens of defensive 14-15th-century castles, perched on the crests of limestone hills in the Cracow and Czestochowa Jura. Some of them were erected for King Casimir the Great, others belonged to the spiritual and temporal lords of Poland. Today these spectacular ruins run in a great chain across a picturesque landscape. The most impressive links in the chain are the ruins of Bobolice, Mirów, Olsztyn, Tenczyn, and Ogrodzieniec Castles. Ogrodzieniec is regarded as the most beautiful castle ruin in Poland. The Cracow and Czestochowa Jura which is the natural setting for the Eagles' Nests is a favourite with rock-climbers and excellent terrain for cycling and riding. Częstochowa offers its visitors and inhabitants an original and varied cultural programme. The City - Art Gallery, Museum, Theatre, Philharmonic Hall and "Gaude Mater" Centre of Culture Promotion organise many interesting cultural events. The Bronisław Huberman International Violin Festival, "Gaude Mater" International Festival of Sacred Music, "Sacrum" Triennial Art Exhibition deserve special recommendation. In addition to the local government's cultural institutions also many galleries, clubs and cultural associations contribute to the enlivening and enriching of the cultural life of the City. Today Częstochowa is going through a difficult period of the local economy transformations and search for its place on the economic map of our country. Over the last several years due to ownership transformations of the public sector and formation of new private business the share of the private sector in the local economy has been growing steadily and its activities have had greater and greater effect on the overall economic dynamics of the city. Small businesses engaged in trade, services and small production prevail among all economic entities having their registered seats in Częstochowa. The local government has great hopes for the improvement of economic conditions in the City through new domestic and foreign investments located in the Special Economic Zone (currently ultramodern GUARDIAN Glass Works as well as BERGER and TRW automotive industry factories are under construction). in officially published ratings of investor - friendly cities, attracting entrepreneurs with favourable business climate, absorptive power of the market and highly skilled labour. Jasna Góra Monastery is one of the major pilgrimage centres of the Christian world. It is also the second biggest - after Lourdes - centre of the Marian cult. Every year Częstochowa is visited by 3 - 4 million pilgrims and tourists. In 1996 five European towns, functioning as centres of Marian cult i.e. Loreto, Lourdes, Altötting, Fatima and Częstochowa signed a co-operation agreement. The main objective of this co-operation is to share experience in the field of organisation of religion - motivated tourism and to create conditions for wide promotion of these towns. In 1998 Częstochowa - as the first town in Central Europe - received the Europe Prize - Prix de l'Europe - the highest award granted to European local governments by the Council of Europe. Thus the continuity of the local government's efforts for the European integration, maintenance and development of friendly relations with twin and partner towns in Europe and sharing experience in the sphere of culture, education, tourism and economy was acknowledged. Earlier Częstochowa was awarded the Honorary Flag of Europe and the Council of Europe Honorary Plaque. Currently the Mayor of Częstochowa performs the function of the Chairman of the Association of Europe Prize Winning Towns. Under mutual co-operation agreements Częstochowa maintains close relations with many towns, including Loreto, Lourdes, South Bend (Indiana - USA), Fatima, Altötting, Pforzheim, Graz. 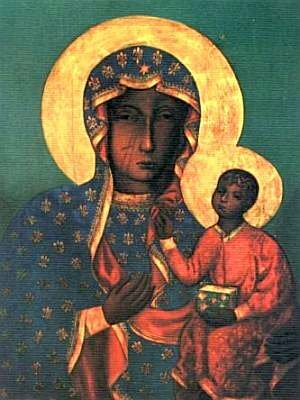 The Black Madonna of Częstochowa (Czarna Madonna or Matka Boska Częstochowska in Polish) icon was, according to legend, painted by St. Luke the Evangelist on a cypress table top from the house of the Holy Family. One of the oldest documents from Jasna Góra states that the picture travelled from Jerusalem, via Constantinople, to finally reach Czętochowa in August 1382. 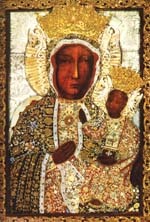 The Black Madonna is credited with miraculously saving the monastery of Jasna Góra (English: Bright Hill) from a Swedish 17th century invasion, The Deluge, which actually changed the course of the war. This event led King Jan Kazimierz to crown Our Lady of Częstochowa (the Black Madonna) as Queen and Protector of Poland in the cathedral of Lwów on April 1, 1656. Częstochowa (cheN'st?kô'v?) , city (1993 est. pop. 258,800), Śląskie prov., S Poland, on the Warta River. It is an important railway and industrial center, known especially for its iron and steel plant and iron-smelting works. Other industries include iron-ore mining, food processing, sawmilling, and the manufacture of chemicals and textiles. Iron ore is mined in the vicinity. Częstochowa is a celebrated religious center, and a world-famous place of pilgrimage. Its monastery stands on the Jasna Gora [mountain of light] and contains an image of Mary known as the Black Madonna, supposedly painted by St. Luke and brought to Częstochowa in the 14th cent. In 1655, when Charles X of Sweden overran Poland, the prior and a handful of soldiers defended the monastery and its relic for 40 days until the Swedes abandoned the siege. Fired by what they thought to be a miracle, the Polish people rose to successful resistance. The event figures prominently in Henryk Sienkiewicz's novel The Deluge. The monastery was again defended against the Swedes in 1702. Venerated as the Queen of Poland, the image became the national symbol of Poland. It is the holiest place of Poland and one of the world's most important destinations for pilgrims. The Jasna Gora (Bright Mount in Polish) sanctuary in Czestochowa, industrial city of 300,000 a ninety minutes' drive northwest from Krakow, has been Central Europe's spiritual hub for six centuries and it shows. Every year several million pilgrims-commoners as well as celebrities-come here to pray before the miraculous picture of Our Lady of Czestochowa. The faithful has believed for ages that St. Luke the Evangelist himself painted the divine icon on a tabletop from the Holy Family's house. Anyway, over the last half-millennium great number of them have had their prayers heard and, grateful, left innumerable votive offerings displayed in the sanctuary. Small 15th-century Gothic chapel with Our Lady of Czestochowa's holy picture is the heart of the sanctuary. It adjoins vast Baroque church of 1695. The fine 105-m-tall tower crowned with viewing gallery dates back to 1620. The adjacent mid-17th-century early-Baroque monastery contains the Great Refectory of 1644, the Knight Hall of 1647, and the 18th-century library with unmatched collection of old books. Fortifications date from 1643 while majestic gates are a century younger. The monastery's treasure-house is a must by virtue of the artistic and/or historical value of its collections. The arsenal and the museum of the sanctuary's 600th anniversary are also worthwhile. With the average of 14,000 visitors a day the sanctuary seems often crowded, yet the feast days of May 3, August 15 and September 8 gather real multitudes from all over the world. Tradition has it that St. Luke the Evangelist painted two pictures of the Virgin Mary on a tabletop once used by the Holy Family. One icon eventually made to Italy's Bologna. Emperor Constantine brought the other from Jerusalem to Constantinople, and some 600 years later it was awarded to Prince Lev of Rus for his military services. In the 14th century a Polish prince, Wladislaw of Opole, found the icon in the Belz castle while he was warring Tatars who had conquered neighboring Rus, and he entrusted the holy image to the Pauline monks in Czestochowa. So says the 1474 volume of Translatio Tabulae from the Jasna Gora library. April 14, 1430, on the Easter, Bohemian robbers looted the Jasna Gora monastery, slashed Our Lady's cheek with swords, and-by the account of the 1523 "Historia Pulchra"-left the holy image on the floor, broken in three. Our Lady of Czestochowa is Poland's holiest icon. Art historians believe Our Lady of Czestochowa was initially a Byzantine icon of the Hodigitria type, dated from the 6th to 9th centuries. During the 15th-centrury restoration in Krakow it was painted anew for the restorers were not able to apply their tempera colors over the original wax paint so they scraped it clean. 1220: the earliest mention of "Czestochowa" in writing. 1356: King Casimir the Great gave Czestochowa municipal autonomy. 1404: King Wladyslaw Jagiello's pilgrimage to Jasna Gora. 1430: Bohemian robbers raided the monastery and smashed the Black Madonna's icon. 1655: despite a fierce and prolonged siege fortified Jasna Gora monastery occurred the only stronghold in Poland Swedish invaders failed to capture, which proved a turning point in the devastating war. 1717: coronation of Our Lady of Czestochowa's picture. 1770-1772: Jasna Gora was a fortress of anti-Russian Bar Confederation insurgents led by Kazimierz Pulaski, future American hero. 1846: opening of the Warsaw-Vienna railroad line through Czestochowa enabled the city's rapid industrialization. 1979: John Paul II visited Jasna Gora for the first time as the pope.